The conventional wisdom on the current financial crisis is that macroeconomic theory has little to say. I am not sure where this idea originated, but there is much that can be explained from existing theory especially in regards to policy. The work of Robert Barro, Charles Plosser and John Long as well as Nobel laureates such as Milton Friedman, Franco Modigliani, Finn Kydland, and Ed Prescott have much to say about the impact of macroeconomic policy. Unfortunately, with a few notable exceptions, the work of these economists has received scant attention during the current crisis. Nonetheless, their work remains important in explaining the futility of much of the current policy prescriptions. Equally disturbing is the return of self-professed Keynesians with policy prescriptions that are wholly inconsistent with both Keynes and modern macroeconomic theory. In fact, a careful reading of each Beige Book from the last year along with a reading of the Federal Reserve’s survey of senior loan officers indicates a drop in loan demand along with a tightening of lending standards throughout the year. 1.) The latest recession is the only recession where total credit outstanding has leveled off for an extended period. (The first recession in the 1980s saw a contraction but only after total credit increased). While it didn’t decrease it also didn’t increase. Compare this to the previous 6 recessions when lending increased at least slightly throughout the recession. In other words, the leveling off of credit creation is a story in and of itself. The Bank of Boston adds other extremely credible explanations for the lack of decline in lending. They note that in a credit crunch companies rely more on their existing lines of credit as other sources of funds (the stock market, commercial paper and new lines of credit) dry up. In addition, banks are unable to securitize loans in the current environment and are therefore forced to keep more loans on their books, thereby increasing lending. The new study does not dispute the increase, but notes its composition: bank customers were drawing on previously established credit lines. While the additional evidence provided is quite useful, please remember that I had already suspected as much. More important, this point about composition in no way refutes the fundamental claim that banks are still lending to many types of customers. Finally, Stewart concludes that the reason that this debate is even occurring is because (1) the TARP has been a disaster, and (2) there is an anti-Wall Street mood right now. Number (1) is clearly correct, but (2) has little bearing on my opinion nor the opinions of serious economists. 1.) The percentage changes from the previous year on a multitude of measures of credit have declined, BUT remain positive. I think that Stewart and I are fundamentally in agreement with regards to the fact that there is a financial crisis. Any time that you have hundreds of firms failing within one single industry, financial stocks that are a mere fraction of their previous value, and an industry that has experienced over $1 trillion dollars in losses, it would be wrong to conclude that this is not an industry in the midst of a crisis. However, it does not follow from the fact that we are in the midst of a financial crisis that we are necessarily in the midst of a credit crisis. There has been a lot written about the Madoff scandal, but I wanted to offer a few comments. The Ponzi scheme has been around (and illegal) since, well, Ponzi. It was not the product of some financial innovation, is clearly against the law, and should have been prevented (at least on such a large scale). The regulatory agencies therefore cannot blame imperfect foresight (as they have done with capital ratios and securitization) for their failure to detect and shut down the Madoff scam. 1.) Regulation is important and we need rules in place against such schemes. Free enterprise operates best when there are rules (whether enforced by government or private entities). 2.) Regulation is only useful if it is actually enforced. One point that I have made regarding the financial crisis is that it was not merely a failure of regulation, but also of regulators. Decisions within regulatory agencies to relax the regulatory standards renders such standards useless. Thus, even with regulation in place, we need regulators who will actually do their job. The Madoff scandal highlights the fact that the regulatory agencies have become nothing more than a joke in terms of enforcement. One way or another, there’s really no way for the economy to grow strongly and consistently unless middle-class consumers spend more, and they can’t spend more unless they make more. This was masked for a few years by the dotcom bubble, followed by the housing bubble, all propped on top of a continuing increase in consumer debt. None of those things are sustainable, though. The only sustainable source of consistent growth is rising median wages. The rich just don’t spend enough all by themselves. This is a widely held view, and I’m as much in favor of a strong middle class as anyone. Nonetheless, I’d say that in terms of strict economics it’s wrong. There’s no obvious reason why consumer demand can’t be sustained by the spending of the upper class — $200 dinners and luxury hotels create jobs, the same way that fast food dinners and Motel 6s do. I have stayed silent on the auto bailout for some time. However, the discussion has gotten so out of control that I have to respond to some of the nonsense. Today’s Detroit Free Press is filled with hate and vitriol for those who dare question the validity of a bailout to the automotive companies. Do you want to watch us drown? Is that it? Do want to see the last gurgle of economic air spit from our lips? If so, senators, know this: You’ll go down with us. America isn’t America without an auto industry. America is not without an auto industry and would not be without an auto industry even if the firms filed bankruptcy. Kill the car, kill the country. History will show that when America was on its knees, a handful of lawmakers tried to cut off its feet. And blame the workers. How suddenly did the workers — a small percentage of a car’s cost — become justification for crushing an industry? This is hyperbole like I have never seen. I am tempted to point out that “a small percentage of a car’s cost” is $20 per hour more expensive than the competitors (not including the retiree benefits). Nonetheless the central point is correct. However, the UAW has said that even if they work for free, that would not be enough to solve the problems of the Big 3. If that is true, it is perhaps the most credible criticism of the bailout yet. In a world where banks hemorrhaged trillions in a high-priced gamble called credit derivative swaps that YOU failed to regulate, how on earth do WE need to be punished? In a bailout era where you shoveled billions, with no demands, to banks and financial firms, why do WE need to be schooled on how to run a business? Who is more dysfunctional in business than YOU? Who blows more money? Who wastes more trillions on favors, payback and pork? At least in the auto industry, if folks don’t like what you make, they don’t have to buy it. In government, even your worst mistakes, we have to live with. I am in full agreement with regards to failures of government. Nevertheless, as my mother would say, “two wrongs don’t make a right.” The fact that the government has wasted countless tax dollars on worthless pork barrel spending and the financial market bailouts does not mean that we should simply throw caution to the wind and hand out money like candy on Halloween. Further, it is time to stop propagating the myth that the reason that the Big 3 are going bankrupt is because of the credit crisis. In fact, those who favor the auto bailout should be thankful for the financial crisis because under any other circumstances, they would not likely have received ANY help. By the way, there are a great number of us who opposed the financial bailouts (myself included). It’s time to drop the moral equivalence argument. Kill the car, kill the country. Sen. Richard Shelby, Sen. Bob Corker, Sen. Mitch McConnell, your names will not be forgotten. It’s amazing how you pretend to speak for America when you are only watching out for your political party, which would love to cripple unions, and your states, which house foreign auto plants. Corker, you’ve got Nissan there and Volkswagen coming. Shelby, you’ve got Hyundai, Honda, Mercedes-Benz and — like McConnell — Toyota. Oh, don’t kid yourself. They didn’t come because you earned their business, a subject on which you enjoy lecturing the Detroit Three. No, they came because you threw billions in state tax breaks to lure them. Why are the jobs created by foreign manufacturers in the United States somehow deemed less significant than those created by the Big 3? How are these senators any different than Debbie Stabenow and Carl Levin speaking up for the auto companies in their state? Also, Mitch is correct to point out that these men convinced these manufacturers to come to their states by throwing money at them. Michigan, of course, could have done the same thing had they allowed the state to be a “right to work” state. Doing so would have allowed the government of the state of Michigan to “throw money” at the foreign manufacturers, who in turn could have employed all the auto workers who have been laid off over the past several years. You’re so fond of the foreign model, why don’t you do what Japanese ministers do when they screw up the country’s finances? Or they resign in shame. No matter what the president does, history will not forget this: At our nation’s most uncertain hour, you senators stood ready to plunge hundreds of thousands of American families into oblivion. Leave them unemployed, with no health care, on public assistance. And you were willing to put our nation’s security at risk — by squashing the manufacturing base we must have in times of war. “Our nation’s most uncertain hour”?! Seriously? Bigger than World War II? Pearl Harbor? September 11? The Civil War? The American Revolution? The hyperbole is off the charts. Also, how many people would lose their jobs? Perhaps someone can give me an estimate as I do not think it would be nearly as many as those who assume that bankruptcy means liquidation. I am not opposed to a debate about the automotive bailouts. I know many people who work in the industry and would likely be devastated by a bankruptcy. However, as harsh as it may sound, we shouldn’t base our decisions on emotions, but rather considering the costs and benefits of the bailout. Contrary to what many in Detroit and Michigan would have you believe, the idea that we should bailout the automakers is not a foregone conclusion that a couple senators fail to understand. Nearly two-thirds of the American people are opposed to the bailout. I look forward to the hate mail. 2.) The bursting of the housing bubble, the increased perception of risk, the fall of Bear Stearns, and the expansion of Federal Reserve power (sorry I couldn’t make this pithy). Over at Cato Unbound the crisis is being debated by the likes of Lawrence White, Brad DeLong, and Casey Mulligan. Each makes particularly intriguing points, but the main point that I would like to address is in regards to the stages of the crisis. We seem to have gotten to the point where everyone is talking past one another because each is talking about a separate stage of the crisis. For example, White’s essay clearly outlines the incentives put forth by the government that contributed to the housing boom. DeLong, however, counters that White is not addressing the important issue and that he even gets the one he is discussing wrong. I think that there are elements of each of their essays that are correct, but I do not agree with DeLong that they are mutually exclusive. White is largely concerned with stage 1 listed above. His essay (helps) explain the cause of the housing bubble, but is quite vague on the impact of the economic shock created by its collapse. DeLong is primarily concerned with stages 2 and 3, or in other words the impact of the economic shock. Further, he asserts that government intervention and monetary policy explain little about the shock. 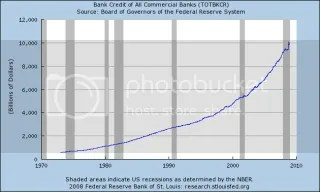 Are we supposed to believe that $200 billion of open-market purchases by the Fed drives private agents into making $8 trillion of privately unprofitable loans? The absolute dollar size of the [open market purchase], however, is not important. What is important is whether these increases in liquidity were excessive relative to the demand for them. One only needs to look at the negative real federal funds rate that persisted over this period to see that these injections were excessive. I think that Beckworth hits the nail on the head here. These injections were clearly excessive as is evident from White’s chart in his Cato policy paper, in which he compares the actual federal funds rate to that which would be predicted by the Taylor Rule. Further, recent research has shown that low interest rates cause banks to lower their lending standards. These would seem to suggest that monetary policy played in important role in causing the economic shock. This brings us to the second point in this discussion: did government intervention cause the housing bubble? I believe that the answer is both yes and no. I am on record in saying that Fannie and Freddie (see here and here) did not cause the crisis. In fact, if you read Stephen Cecchetti’s excellent discussion of the early part of the crisis, you will notice that private securitization of mortgage debt was growing much faster than that of the GSEs in the early part of this decade. Nonetheless, I believe that government policy did play a minor role in creating the housing boom (as I will discuss below). As previously mentioned, monetary policy seems to have played a crucial role in the financial crisis. However, the fact that monetary policy stoked the fire says little about why all of this money flowed into housing. I think that there are two main culprits: (A) Securitization, and (B) Government policy; the former being a necessary condition for the latter to have a meaningful impact. Allow me to explain. In private conversations with our friend Barry Ritholtz about these matters, he has challenged me to explain why the Community Reinvestment Act (CRA) did not create a boom (or crisis) from 1977 to 2002. This is a fair point and one that I think few (if any) have failed to address. What changed in recent years is that (i) the CRA received some teeth in 1995, (ii) the Federal Reserve lowered interest rates to historic lows for an extended period of time, and (iii) the increased use of private securitization. Ultimately, I think that (ii) and (iii) are the most important both in creating the economic shock and that (i) played a minor role in that the other two factors facilitated the compliance with government policy. When government regulation is created, there is an immediate incentive to circumvent the regulation. However, the use of securitization essentially made it easier for banks to comply with CRA (by buying securitized mortgages that complied or by issuing the mortgages themselves and selling them off as part of an ABS in the future). Thus far all we have is lower bound estimates of the impact of the CRA on subprime loans, but this lower bound is decidedly not zero. As the link above indicates, a recent Fed study indicated that only about 8% of subprime loans can be correctly tied to the CRA. Nevertheless, as Lawrence White points out in that post, this ignores potential “demonstration” effects. In other words, once banks who are not required to comply with the CRA discover that other banks are making these loans somewhat successfully, they might be more inclined to enter the market to compete directly with these firms (this might explain why 75% of troubled mortgages originate from firms that are not required to comply with the CRA). In any event, however, it is unlikely that the percentage of subprime that originated directly as a result of CRA exceeds 20% and therefore must be deemed a relatively small factor. To summarize, I believe that monetary policy and the increased use of securitization are to blame for the creation of the economic shock and the subsequent chaos in its aftermath. Nonetheless, I think that government policy does play a minor role in explaining the creation of the shock.